We are pleased to announce solo exhibition of TANADA Koji at Mizuma Art Gallery, starts from January 28th, 2009. 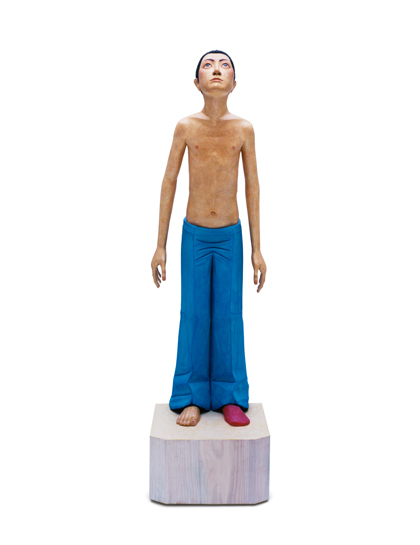 Last September, Tanada introduced his twelve new works at his solo show at The Vangi Sculpture Garden Museum, titled “Eleven Boys, One Girl.” He made these works and capitalized on the space of it. It was very successful. His solo exhibition at Mizuma Art Gallery is composed with these works and one new work. 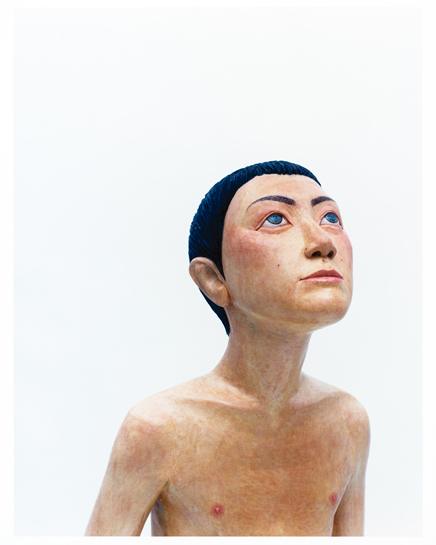 Since year 2003, TANADA Koji has been creating boy/girl figure with consistent way of creating process. He leaves the viewers how they see the works, and the meaning of them. In Japan, through the ages, people uses whiting to paint on wooden sculpture (especially Buddha statue). However, Tanada uses new medium such as natural oil paint for wooden floor and acrylic paint. With his own technique, he creates sculptural works that have pictorial element. The shapes of his figures are pretty concrete. However, their titles are abstract that don’t define the meaning. The balance between these has been given firm presence to his works. Tanada’s clear approach is certainly about to become established. 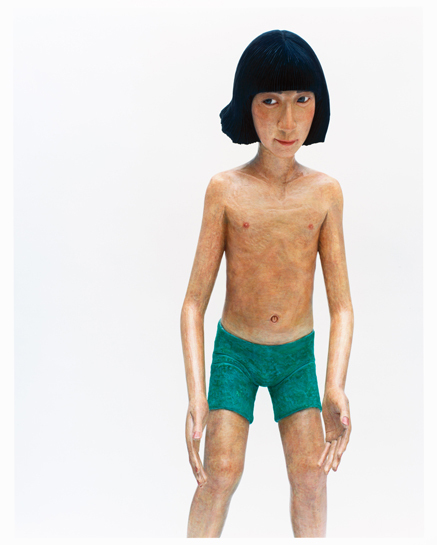 The eleven sculptures that he created for the solo exhibition at VANGI MUSEO, he used his close women as models, and sculpted boy-figure (the rest of one figure’s model is Tanada himself), and this kind of process is first approaches for him. The new work he is going to introduce at this exhibition, “girl tying” is the work that vaults his means of expression that he has been cultivating. Recent years, Tanada introduced works that have double-barreled title, such as “girl weaving herself” and “fortress” (“girl weaving herself” is knitting something, and/or knitting herself (her life). “fortress” is being guarded by something and/or guarding something.). His new work, “girl tying” was created according to the image of knotting various opposite notion, such as “terrorism” and “peace,” “satiation” and “famine,” and “reality” and “future.” We, living in this present age, have to take various things, and make an effort to understand them. “Knotting,” which Tanada brings up, may mean tying up these opposing world. Tanada explains why he creates boy/girl figure, “for they are holy existence.” There are unlimited possibilities in them. His new work, “girl tying,” who puts one foot in front of her and is about to go forward, is casting new point of view at us. We would like you to see the works of Tanada that impressed many people at VANGI MUSEO, and a new work which is in his new development, “girl tying”, whose desire is to tying various notions with big circle.